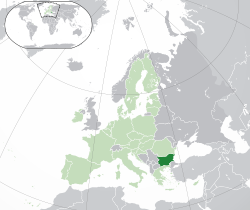 Bulgarie (Bulgarie: България) or is it is offeecially kent, the Republic o Bulgarie (Bulgarie: Република България) is a kintra in sooth-eastren Europe. It is bund bi the Black Sea tae the east an haes a laund mairch wi Greece an Turkey tae the sooth, the Republic o Macedonie an Serbie tae the wast an Romanie tae the north. Frae the 1st o Januar 2007 it became a member o the European Union. ↑ 19 Februar in the Julian calendar uised at the time. ↑ 22 September in the Julian calendar uised at the time. ↑ NSI Census data 2011, p. 4. ↑ 6.0 6.1 "Bulgaria". International Monetary Fund. Retrieved 15 October 2017. This page wis last eeditit on 15 Dizember 2018, at 07:20.